A few of us will be at the garden this Thursday 12 January 5-6pm to do a bit of weeding and tidying up on the northern verge. We’d love you to join us. A reminder we all need to keep on top of weeds on the paths and around the fruit trees. If you could spend 10 minutes weeding and spreading mulch it’d make a big difference. Huge new piles of mulch are on the northern verge. 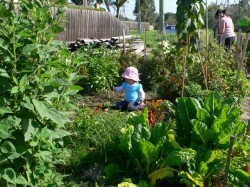 Thanks to the elves who’ve been watering and tending to the communal beds and sensory garden. They’re looking great. Finally, there’s a load of garden soil on the northern verge for plot holders who need to top up their plots. Its between the olive trees, under black plastic. Get in quick. It’s nearly all gone. This entry was posted in Calendar, events, news by ingrid. Bookmark the permalink.